[Guild Wars 2] Ascalonian Catacombs conquered! Ok. About the dungeon... Our first attempt on it was about over a week ago. We got to the halfway point of it but had to stop since it was late and people had to go to work early the next day. As much as I hate to admit it that was probably for the best. Our group at the time just weren't ready for it. Both in terms of character build, gear and actual group tactics. So we broke up with the intention of working on those parts and give it a try again in the weekend. Well, those were our intentions anyway. The others dealt with the two first issues without problems but as far as everything else we just didn't do it since my sleeping pattern got messed up really bad. That means I was sleeping during some very odd times while being awake in some even odder times. It is not unusual for that to happen to me and when that happens it is a pain to get it back to something resembling normalcy. It also affected my mood too, with a start of depression. With all that going on I just wasn't able to get a group together again to give it a try. It also didn't allow me to be present when they went for it on Friday and actually succeeded. Yesterday though I had set my mind in getting a dungeon run going on with our guild. My plan was to give a try to Cadeceus Manor since we had enough people at the required level plus I thought it would be too early to try getting another run at Ascalonian Catacombs since people already did it on Friday. That plan got changed first, then scrapped later. The reason for that is because another guildie really wanted to do something together with the guild but his highest character was level 30 (the minimum level for Ascalonian Catacombs. Cadeceus Manor being a level 40ish dungeon). The other interested parties agreed to give it a try though with the intention to do Cadeceus Manor after it if we still had time and energy. Turned out we didn't plus one of the members who were going to Cadeceus Manor end up having some hardware issues, having to call it an early night. So Ascalonian Catacombs was the only dungeon we did. Our group consisted of an engineer (yours truly), an elementalist and three rangers. The funny thing is that when we got together we found out we were all wearing green thus we quickly dubbed our group as "Team Green". Not the most imaginative names, true, but it was better than my suggestions of "Team Lettuce" or "Team Cabbage". Anyway, this time everything went much better. The first half of the dungeon was much smoother. Mobs were dying fast, traps were getting dealt with just as quickly and there was never that sensation of being a headless chicken trying to figure out what was going on, like in our fist attempt. The second half started a little more rougher due to some misuse of knock back skills that end up knocking back some of the mobs to other mobs thus getting ourselves overwhelmed. Still we managed and once the knocking back stopped things went back to be relatively smooth. Some of the boss fights were slightly rougher, specially the last one. Still we did pretty well in all of them too. I liked also how each of those fights had their own tricks but without ever feeling unfair. There was always enough visual cues, as well as some NPC dialogue, that you could always know what was going on or what you could do to make things easier. This way when any of us died we knew exactly why it happened and what to look for when we revived. In any case, I had a blast with that dungeon run. Yes, I died a lot. Probably the one who died the most of the whole group. But it was still fun. I loved the whole story of the dungeon as we progressed through it. So much, in fact, that I could do it a hundred times and I would still enjoy it. It was also fun because despite it being relatively short it was also pretty intense. There was no fight where I felt I could just sleep through it. All fights, be it against regular mobs or the boss fights, required my full attention to get through it. I also felt like we worked more as a team this time. Yes, there wasn't much in the way of going through elaborate plans that went into the tiniest detail for the boss fights. Yet I still felt we had a much stronger teamwork going on this time. The only way I can explain it is that it was more the kind of teamwork born out of unspoken words, of trust in one's skills, your companions abilities and that they will be watching your back as much as you will be watching theirs. A pretty vague explanation though it is one that I think a lot of the Guild Wars 2 players can understand or relate to. Designate one of your group members to put target marks on the mobs. You can do that by pressing Ctrl + Click on a mob. This will put a huge target mark on top of the chosen mob and others can just target it by pressing the T key. This way it is easy for your party to focus fire on the same mob. Probably the best order to take down the mobs is: Rangers first, then elementalists as they are the most dangerous. After that it is a bit more flexible. But I think it necromancers and monks are the most dangerous after those two with mesmers and warriors being on the bottom of the danger list. Try to always take the fights to a more open space so your group can scatter and move around more freely thus avoiding the mobs AoEs or dodging their attacks. Don't rush ahead. Just take things slowly so you can see what kind of mobs is ahead of you so your group is prepared to fight. If you die, revive then run back to the fight. There should be enough free way points there that it shouldn't be an issue. awww! It is ok. You by far make up for it with that stylish hat! Was there a broken armor merchant in the instance by chance? I was thinking of saving my repair canisters for my first story run, but if there is a merchant I will shove em in a corner of my bank vault for later. 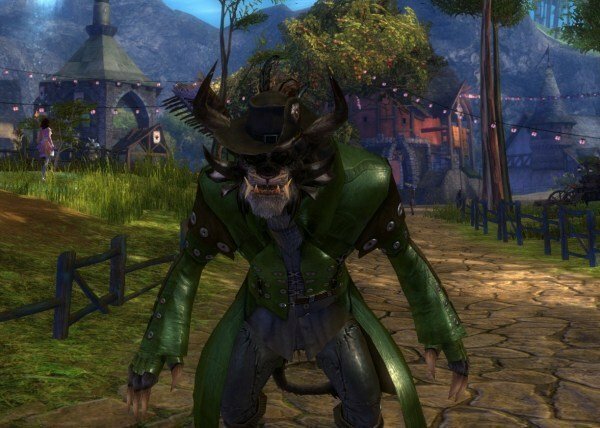 That hat by the way is the medium armor reward for completing the instance. So if you go with a medium armor wearing class you will get one of that too. Light armor got a cowl to use and I don't know what is the reward for heavy armor users. And there is, yes. It is a small anvil right at the dungeons beginning. There is a free waypoint there too so it is easy to go back to repair if necessary. First, whoa, site revamp, your confusing me. Second, went smoother, if not perfect, we ended up using more tactics, Not perfect but we did well. Third, well, we were down a guardian, and Celesteral's 80 ranger (even scaled down to dungeon) so i think that made it harder. What I didn't like was the boss fights turning into zerg fests, didn't seem right somehow, mostly just the last one. What I did love, was being able to do it with all guild memebers, I don't mind meeting new members but I'll need to level up someone for the next batch of guildies coming up 🙂 I do think that equipment (and skills and traits) makes a big difference. I took some pics, I'll put them on the forums. The blog revamp was a much needed one. Still not my original design as I've found that there were a lot of limitations since I have a free account. But this theme will do for now. Well, the first one none of us had any clue about what to expect and we have been pretty much soloing until that point. So that was our first real group experience. The second one I wasn't there for it. The third one I didn't feel a guardian, or any other particular class,was needed. In fact I think it proves quite well that you can do those dungeons with any combination of class. I disagree about the boss fights being zerg fests as I had to actually pay attention to what the bosses were doing. Standing on those red circles hurt so I had to keep an eye on it and the hell out of them. Also, Celesteral wasn't with us on the third run. She was one the first attempt and I don't know about the second. On the third run the other rangers were you, Tish and Sonya. Yay! I did AC last week, too. It was a PuG, but the guy who lead it knew what he was doing, and it went really well, all things considered. Your tips are spot on, too. *cheers* Having people who know the place definitely helps as they can explain the fights and why you need to take down rangers and elementalists first! I really enjoyed going in there with guild members during those first two runs, it's so much fun to die together! Agreed! Now we need to do Cadeceu's Manor and then when more people get levels the 50ish level dungeon whose name I forgot! They did? Hm. Oh, well, I am still interested on giving it a try, regardless of difficulty.